Boston is a great city to explore and enjoy seafood restaurants, whether on the waterfront or dotted in and around the hotel’s location in the Back Bay. But the iconic lobster roll, by definition, has to come from the cold waters up the coast……in the great state of Maine.…a mere 60 mile drive North along route I-95 from downtown Boston. Driving along the Maine coastline with its beautiful harbors and jagged coastline is a scene not to be missed. 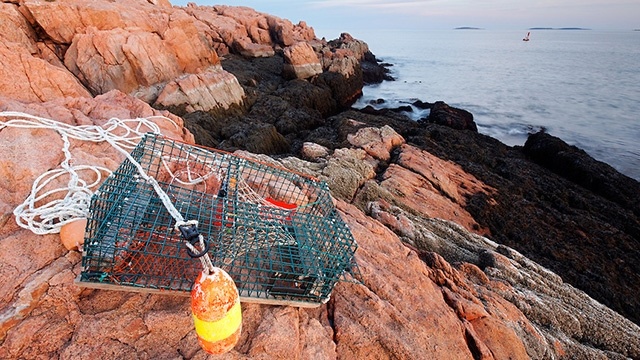 While Maine’s nickname is the Pine Tree State, it’s much more famous for the best, freshest lobster on the planet. Since you have traveled so far to get to Boston, why not try a northern excursion to enjoy a bit of heavenly crustaceans. To be fair, my wife and I enjoy a summer home in Southern Maine so I am a bit impartial when it comes to my lobster as well as the relaxed atmosphere I feel as soon as I cross the border. While there are many ways to prepare and eat lobster, there is no more of a great equalizer than comparing the incredible selection of lobster rolls. So let’s get started on our lobster adventure. 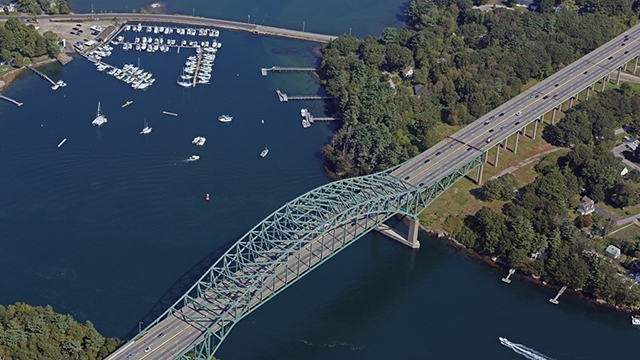 As you drive over the Piscataqua River Bridge just past Portsmouth, NH (a quaint seaside town to visit), you’ll smell the salt air, and you’ll know you are close! 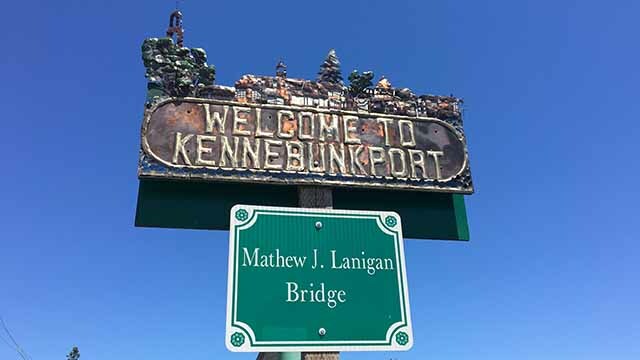 You have just passed the Maine border. 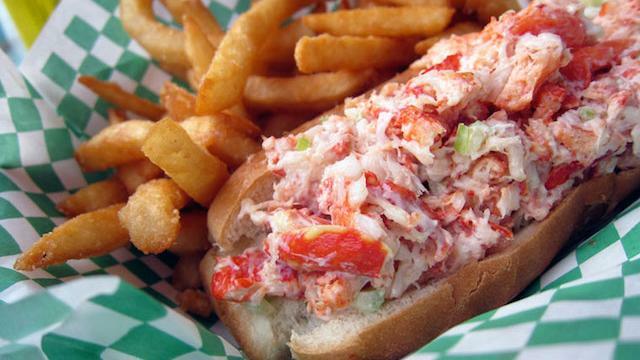 One of the best lobster rolls I have found is in Kittery on US Route 1 – Bob’s Clam Hut. Bob’s has a large gravel parking lot and is located directly in the middle of the outlet shopping area….a great area for a rainy day. Don’t be fooled by the modest surroundings, their extra-large lobster roll is overflowing with fresh Maine lobster! With their light mayo dressing, the lobster taste really shines! Enjoy a cup of their famous clam chowder. Continuing on Rt1 North will bring you to a picturesque village by the sea, often named one of the world’s best beaches, Ogunquit. Head over to Perkins Cove and its bustling little harbor to Barnacle Billy’s, often frequented by President George W. Bush who arrives on his secret service boat from nearby Kennebunkport. Billy and family offer a great “Lobster in the Rough” menu. Grab an outdoor seat on the deck with a pint of beer…..nothing beats that view and combination! 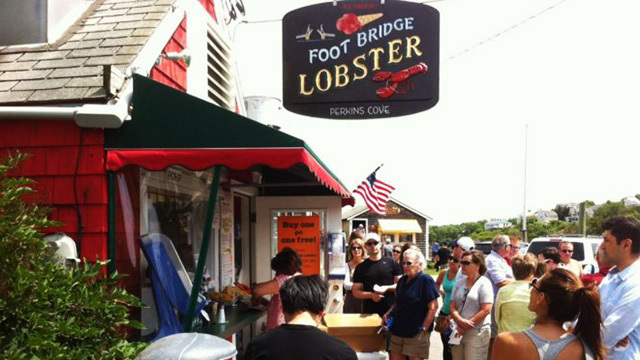 If you want to eat at the beach or a simple meal on a bench overlooking stunning Perkins Cove harbor, head over to Footbridge Lobster or next door to the Lobster Shack. Both are better deals than Billy’s but without the outdoor deck. And if you are a purist, ask for your roll “naked” with butter on the side…then all you’ll get it pure lobster meat with no fillers! P.S. look up on the bluff beyond the mouth of the harbor and you can see my house! 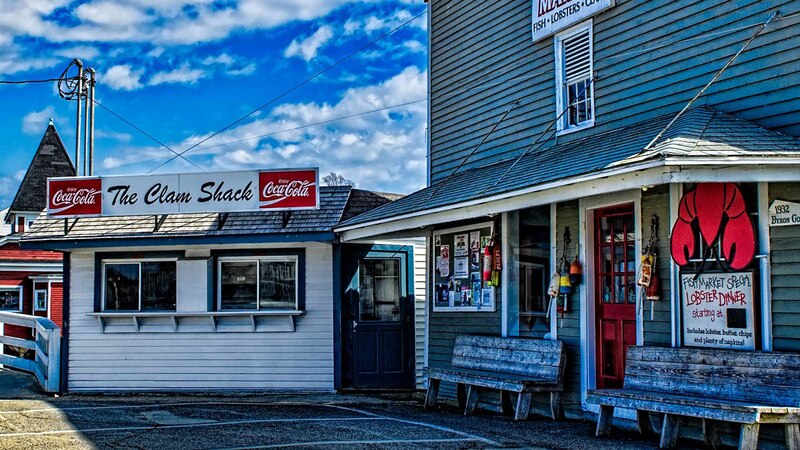 The next must stop is in the gorgeous village of Kennebunkport, and is not complete without a lunch at The Clam Shack, 2 Western Ave. Situated with the river on one side and a parking lot on the other, this spot serves up one of the most talked about lobster rolls in the US. They begin with a grilled, round, locally sourced bun and add the meat of a one pound lobster-you may add a drop of butter or mayo or both-this sandwich is a great combo of a delicious roll topped with fresh plentiful lobster meat. Fried clams are also a must try specialty of this tiny fish shack with picnic table seating. Further north, you arrive in Portland-one of Maine’s most food centric cities! A great place to walk among history. Of the many wonderful dining options, Eventide Oyster Co., is where you will find a most interesting lobster roll option. Famous for their incredible oyster selection and creative mignonettes served with a hipster vibe, their buttered lobster roll is also amazing! The lobster roll is actually a steamed bun filled with hot lobster in a brown butter sauce…so rich and tiny, two are not enough! If you enjoy sitting over the water, try Boone’s Fish House and Oyster Room. Their oysters selection is huge and always fresh and the lobster roll melts in your mouth. Enjoy! !